Gaywings (Polygala paucifolia) is one of our more curious-looking local wildflowers. It emerges from the forest floor in the month of May. This low growing plant of dry, rich woods, has unusual orchid-like flowers, and is known by several common names including flowering wintergreen and fringed polygala. The blossoms are pink to rose-purple in color, about 1-1.7 cm long, and usually found growing singly in the axils of the upper leaves. When in full bloom, two prominent petals flare out from the corolla, framing a whimsically fringed petal at the center. 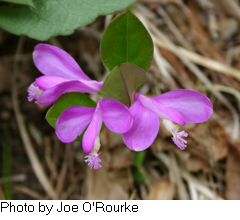 Gaywings is not an orchid but is actually one of over 60 members of the genus Polygala that occur in the US. Polygalas make up a large part of the Milkwort family (Polygalaceae), the name stemming from the Greek for ‘much’ (poly) and ‘milk’ (gala). This is because eating milkworts was believed to increase lactation in mammals such as cows and even humans. Other Polygala species that occur in the northeast include the short-leaved and cross-leaved milkworts (P. brevifolia and P. cruciata) and one rare orange variety, P. lutea. Generally, these others are easily distinguishable from gaywings, having much smaller flowers that occur in spikes or racemes. Like many spring wildflowers in the temperate zone, most Polygala species rely on ants to disperse their seeds, a strategy called myrmecochory. Polygala seeds have nutrient-rich attachments called elaiosomes that attract ants, which then drag the seeds into their nests. Ants feed the elaiosomes to their young, leaving the detached seed to germinate underground, far from the parent plant. Scientists have determined that the elaiosome evolved in this plant group about 55 million years ago and that this allowed the evolution of many new, specialized species of Polygala. This was well before the diversification of ants themselves, so it is most likely that the elaiosome originally had some other function before it was co-opted as a bribe for seed dispersal services! Gaywings is an endangered species in Indiana, Kentucky, and Ohio, but it is secure throughout the rest of its range from central and eastern Canada down the east coast to Georgia. Herbarium records from the Bailey Hortorium and New York Botanical Garden historically place this species in Tompkins County at locations such as Ellis Hollow Swamp, along Six-mile Creek, and in parts of Danby. In more recent years FLNPS members have spotted this charming wildflower at Buttermilk Falls and at Beaver Lake Nature Center, north of Syracuse where you might be able to catch a glimpse of it this year.